Pamela Z is a San Francisco-based composer/performer and media artist who works primarily with voice, live electronic processing, and sampling technology. She creates solo works combining experimental extended vocal techniques, operatic bel canto, found objects, text, digital processing, and MIDI controllers that allow her to manipulate sound with physical gestures. In addition to her solo work, she has composed and recorded scores for dance, theatre, film, and new music chamber ensembles. Her large-scale multi-media works have been presented at venues including Theater Artaud (San Francisco); ODC (San Francisco); The Kitchen (New York); Whitney Museum (New York); the Diözesanmuseum (Cologne); and the Krannert Art Museum (Illinois). Her multi-media opera Wunderkabinet—based on the Museum of Jurassic Technology and created in collaboration with Matthew Brubeck and Christina McPhee—has been presented at The LAB Gallery (San Francisco); REDCAT (Disney Hall, Los Angeles); and Open Ears Festival (Toronto). Pamela Z has toured extensively throughout the United States, Europe, and Japan. 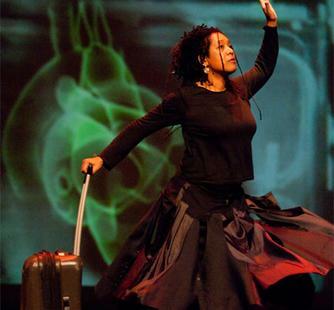 She has performed in numerous festivals including Bang on a Can at Lincoln Center (New York); Interlink (Japan); Other Minds (San Francisco); Pina Bausch Tanztheater Festival (Wuppertal, Germany); and La Biennale di Venezia (Italy). She is the recipient of numerous awards including a Guggenheim Fellowship, the Creative Capital Fund, the CalArts Alpert Award in the Arts, the ASCAP Music Award, an Ars Electronica honorable mention, and the NEA and Japan/United States Friendship Commission Fellowship. She holds a music degree from the University of Colorado at Boulder.